Today marked the beginning of the Windows Phone era for Nokia. The company announced to make the Micorosft platform its primary OS just before the MWC in February, but it's only now, at Nokia World that it finally had actual products to show us. 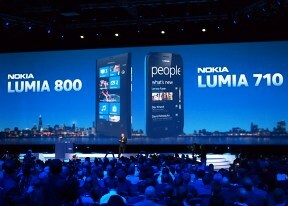 The Nokia CEO, Steven Elop, stepped on stage and unveiled the Nokia Lumia 800 and Lumia 710. The Lumia 800 borrows the Nokia N9 unibody design and comes with a 3.7" ClearBlack AMOLED, a 1.4GHz Scorpion CPU, 512 MB of RAM and 16GB of storage under the hood. An 8 megapixel camera with super bright f/2.2 lens is what does the shooting on the Nokia Lumia 800. The snapper also does 720p video@30fps. The Nokia Lumia 710 is a more affordable device (€270 pre-tax vs €420 pre-tax for the Lumia 800), that comes with a slightly different design, but the same 1.4 GHz Scorpion CPU. It trades the AMOLED for a more conventional, LCD screen and gets a 5 megapixel camera instead of an 8 megapixel shooter. The Lumia 710 will be available in stealthy black and crisp white at launch with extra swappable covers that match the WP tile color options. Along with the two headliners, Nokia announced four new S40 handsets. Nokia Asha 200, Asha 201, Asha 300, Asha 303 are all budget-minded cell phones aiming to bring good connectivity options without breaking the bank. Find out more about them here. The only notable absentee was Nokia 900, which leaked last night, but obviously didn't make it in time for the announcement today, so we'll have to wait a bit more to meet the 4.3" beast. After the press conference we got a chance to play with the newly announced devices. You can find live photos and our first-hand impressions of all of them on the following pages. We begins with the Nokia 800 Lumia right after the break. This is very upsetting that this mobile don't support many of the useful software such as opera mini, uni language code, and so on.